This article is about the mass social movement in China. For other uses, see Red Guards (disambiguation). Chairman Mao has defined our future as an armed revolutionary youth organization...So if Chairman Mao is our Red-Commander-in-Chief and we are his Red Guards, who can stop us? First we will make China Maoist from inside out and then we will help the working people of other countries make the world red...And then the whole universe. Despite being met with resistance early on, the Red Guards received personal support from Mao, and the movement rapidly grew. Mao made use of the group as propaganda and to accomplish goals such as destroying symbols of China's pre-communist past, including ancient artifacts and gravesites of notable Chinese figures. Moreover, the government was very permissive of the Red Guards, and even allowed the Red Guards to inflict bodily harm on people viewed as dissidents. The movement quickly grew out of control, frequently coming into conflict with authority and threatening public security until the government made efforts to rein the youths in. The Red Guard groups also suffered from in-fighting as factions developed among them. By the end of 1968, the group as a formal movement had dissolved. 2.1 Attacks upon the "Four Olds"
The first students to call themselves "Red Guards" in China were a group of students at the Tsinghua University Middle School who were given the name Red Guards to sign two big-character posters issued on 25 May – 2 June 1966. The students believed that the criticism of the play Hai Rui Dismissed from Office was a political issue and needed greater attention. The group of students, led by Zhang Chengzhi at Tsinghua University Middle School and Nie Yuanzi at Peking University, originally wrote the posters as a constructive criticism of Tsinghua University and Peking University's administration, who were accused of harboring intellectual elitism and bourgeois tendencies. The Red Guards were denounced as counter-revolutionaries and radicals by the school administration and fellow students, and were forced to secretly meet amongst the ruins of the Old Summer Palace. Nevertheless, Chairman Mao Zedong ordered that the manifesto of the Red Guards be broadcast on national radio and published in the People's Daily newspaper. This action gave the Red Guards political legitimacy, and student groups quickly began to appear across China. Due to the factionalism already beginning to emerge in the Red Guard movement, Liu Shaoqi made the decision in early June 1966 to send in Communist Party of China (CPC) work teams. These work groups were led by Zhang Chunqiao, head of China's Propaganda Department, and were the attempt by the Party to keep the movement under its control. Rival Red Guard groups led by the sons and daughters of cadres were formed by these work teams to deflect attacks from those in positions of power towards bourgeois elements in society, mainly intellectuals. In addition, these Party-backed rebel groups also attacked students with 'bad' class backgrounds (these included the children of former landlords and capitalists). These actions were all attempts by the CPC to preserve the existing state government and apparatus. Mao expressed personal approval and support for the Red Guards in a letter to Tsinghua University Red Guards on 1 August 1966. He gave the movement a more public boost at a massive rally on 18 August at Tiananmen Square. Mao appeared atop Tiananmen wearing an olive green military uniform, the type favored by Red Guards, but which he had not worn in many years. He personally greeted 1,500 Red Guards and waved to 800,000 Red Guards and onlookers below. The rally was led by Chen Boda, and Lin Biao gave a keynote speech. Red Guard leaders led by Nie Yuanzi also gave speeches. A high school Red Guard put a red arm band inscribed with the characters for "Red Guard" on the Chairman, who stood for six hours. The 8-18 rally, as it was known, was the first of eight receptions the Chairman gave to Red Guards in Tienanmen in the fall of 1966. It was this rally that signified the beginning of the Red Guards' involvement in implementing the aims of the Cultural Revolution. A second rally, held on 31 August, was led by Kang Sheng and Lin Biao also donned a red arm band. The last rally was held on 26 November 1966. 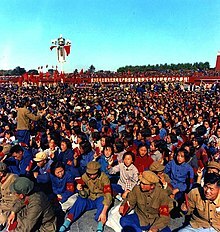 In all, the Chairman greeted eleven to twelve million Red Guards, most of whom traveled from afar to attend the rallies including one held on National Day 1966, which included the usual civil-military parade. Attacks upon the "Four Olds"
The 11th Plenum of the CPC Central Committee had ratified the 'Sixteen Articles' in August 1966, a document that stated the aims of the Cultural Revolution. It also highlighted the role students would be asked to play in the movement. After the 18 August rally, the Cultural Revolution Group directed the Red Guards to attack the 'Four Olds' of Chinese society (old customs, old culture, old habits and old ideas). For the rest of the year, Red Guards marched across China in a campaign to eradicate the 'Four Olds'. Old books and art were destroyed, museums were ransacked, and streets were renamed with new revolutionary names and adorned with pictures and the sayings of Mao. Many famous temples, shrines, and other heritage sites in Beijing were attacked. The Cemetery of Confucius was attacked in November 1966 by a team of Red Guards from Beijing Normal University, led by Tan Houlan. The corpse of the 76th-generation Duke Yansheng was removed from its grave and hung naked from a tree in front of the palace during the desecration of the cemetery. Attacks on other cultural and historic sites happened between in 1966 and 1967. One of the greater damages was to the Ming Dynasty Tomb of the Wanli Emperor in which his and the empress's corpses along with a variety of artifacts from the tomb were destroyed by student members of the Red Guard. Between the assaults on Wan Li and Confucius' tombs alone, more than 6618 historic Chinese artifacts were destroyed in the desire to achieve the goals of the Cultural Revolution. Individual property was also targeted by Red Guard members if it was considered to represent one of the Four Olds. Commonly religious texts and figures would be confiscated and burned. Other times items of historic importance would be left, but defaced, with examples such as Qin Dynasty scrolls having their writings partially removed and stone and wood carvings having the faces and words carved out of them. Re-education came alongside the destruction of previous culture and history, throughout the Cultural Revolution schools were a target of Red Guard groups to teach both the new ideas of the Cultural Revolution; as well as to point out what ideas represented the previous era idealizing the Four Olds. For example, one student, Mo Bo, described a variety of the Red Guards activities taken to teach the next generation what was no longer the norms. This was done according to Bo with wall posters lining the walls of schools pointing out workers who undertook "bourgeois" lifestyles. These actions inspired other students across China to join the Red Guard as well. One of these very people, Rae Yang, described how these actions inspired students. Through authority figures, such as teachers, using their positions as a form of absolute command rather than as educators gave students a reason to believe Red Guard messages. In Yang's case it is exemplified through a teacher using a poorly phrased statement as an excuse to shame a student to legitimize the teachers own position. The most gruesome aspects of the campaign included numerous incidents of torture, murder, and public humiliation. Many people who were targets of 'struggle' could no longer bear the stress and committed suicide. In August and September 1966, there were 1,772 people murdered in Beijing alone. In Shanghai there were 704 suicides and 534 deaths related to the Cultural Revolution in September. In Wuhan there were 62 suicides and 32 murders during the same period. Intellectuals were to suffer the brunt of these attacks. Many were ousted from official posts such as university teaching and allocated manual tasks such as "sweeping courtyards, building walls and cleaning toilets from 7am to 5pm daily" which would encourage them to dwell on past "mistakes". An official report in October 1966 reported that the Red Guards had already arrested 22,000 'counterrevolutionaries'. The Red Guards were also tasked with rooting out 'capitalist roaders' (those with supposed 'right wing' views) in positions of authority. This search was to extend to the very highest echelons of the CPC, with many top party officials, such as Liu Shaoqi, Deng Xiaoping and Peng Dehuai being attacked both verbally and physically by the Red Guards. Liu Shaoqi was especially targeted, as he had taken Mao's seat as Chairman of the People's Republic following the Great Leap Forward. Although Mao stepped down from his post as a sign of accepting responsibility, he was angered that a capitalist roader like Liu could take the reins of communist China. The Red Guards were not completely unchallenged. The Red Guards were not permitted to enter Zhongnanhai, the Forbidden City, or any military facility which was tasked with classified information (i.e. special intelligence, Nuclear Weapons development). Several times, Red Guards attempted to storm Zhongnanhai and the 8341 Special Regiment, which was responsible for Mao's security, fired upon the Red Guards. When Jiang Qing promoted the idea that the Red Guards should "crush the PLA" and Lin Biao being seemingly supportive of her plans (such as allowing Red Guards to loot barracks) while at the same time oblivious to the ongoing chaos the PLA had to deal with, several military commanders disregarded their chain of command and attacked Red Guards whenever their bases or people were threatened. When Red Guards entered factories and other areas of production, they encountered resistance in the form of worker and peasant groups who were keen to maintain the status quo. In addition, there were bitter divisions within the Red Guard movement itself, especially along social and political lines. The most radical students often found themselves in conflict with more conservative Red Guards. The leadership in Beijing also simultaneously tried to restrain and encourage the Red Guards, adding confusion to an already chaotic situation. On the one hand, the Cultural Revolution Group reiterated calls for non-violence. On the other hand, the People's Liberation Army was told to assist the Red Guards with transport and lodging, and help organize rallies. By the end of 1966, most of the Cultural Revolution Group were of the opinion that the Red Guards had become too much of a political liability. The campaign against 'capitalist-roaders' had led to anarchy, the Red Guards' actions had led to conservatism amongst China's workers, and the lack of discipline and the factionalism in the movement had made the Red Guards politically dangerous. 1967 would see the decision to dispel the student movement. "Enveloped in a trance of excitement and change", all student Red Guards pledged their loyalty to Chairman Mao Zedong. Many worshipped Mao above everything and this was typical of a "pure and innocent generation", especially of a generation that was brought up under a socialist party, which discouraged religion altogether. Excited youths took inspiration from Mao's often vaguely open ended pronouncements, generally believing the inherent sanctity of his words and making serious efforts to figure out what they meant. Factions quickly formed based on individual interpretations of Mao's statements. All groups pledged loyalty to Mao and claimed to have his best interests in mind, yet they continually engaged in verbal and physical skirmishes all throughout the Cultural Revolution, proving that there was no core political foundation at work. This domestic anarchy continued until the second half of the Cultural Revolution, when the 9th Central Committee of the Communist Party of China started civil policies. Youth from families with party-members and of revolutionary origin joined conservative factions. These factions focused on the socio-political status quo, keeping within their localities and working to challenge existing distributions of power and privilege. Those from the countryside and without ties to the Chinese Communist Party often joined radical groups who sought to change and uproot local government leadership. The primary goal of the radicals was to restructure existing systems of inequality to benefit those of poorer backgrounds, as the supposed capitalist roaders who were corrupting the Socialist agenda. Primarily influenced by travel and a freer exchange of ideas from different regions of China, more joined the radical, rebel factions of the Red Guards by the second half of the Cultural Revolution. Some historians, one being Andrew Walder, argue that individuals and their political choices also influenced the development of Red Guard factions all across China. Interests of individuals, interactions with authority figures, and social interactions all altered identities to forge factions that would fight for new grievances against "the system". By February 1967, political opinion at the center had decided on the removal of the Red Guards from the Cultural Revolution scene in the interest of stability. The People's Liberation Army (PLA) forcibly suppressed the more radical Red Guard groups in Sichuan, Anhui, Hunan, Fujian, and Hubei provinces in February and March. Students were ordered to return to schools; student radicalism was branded 'counterrevolutionary' and banned. There was a wide backlash in the spring against the suppression, with student attacks on any symbol of authority and PLA units. An order from Mao, the Cultural Revolution Group, the State Council, and the Central Military Affairs Committee of the PLA on 5 September 1967 instructed the PLA to restore order to China. The PLA violently put down the national Red Guard movement in the year that followed, with the suppression often brutal. A radical alliance of Red Guard groups in Hunan province called the Sheng Wu Lien was involved in clashes with local PLA units, for example, and in the first half of 1968 was forcibly suppressed. At the same time the PLA carried out mass executions of Red Guards in Guangxi province that were unprecedented in the Cultural Revolution. The final remnants of the movement were defeated in Beijing in the summer of 1968. Reportedly, in an audience of the Red Guard leaders with Mao, the Chairman informed them gently of the end of the movement with a tear in his eye. The repression of the students by the PLA was not as gentle. After the summer of 1968 some more-radical students continued to travel across China and play an unofficial part in the Cultural Revolution, but by then the movement's official and substantial role was over. From 1962 to 1979, 16 to 18 million youth were sent to the countryside to undergo re-education. Sending city students to the countryside was also used to defuse the student fanaticism set in motion by the Red Guards. On December 22, 1968, Chairman Mao directed the People's Daily to publish a piece entitled "We too have two hands, let us not laze about in the city", which quoted Mao as saying "The intellectual youth must go to the country, and will be educated from living in rural poverty." In 1969 many youth were rusticated. Many students could not deal with the harsh life and died in the process of reeducation. The Red Guards and the wider Cultural Revolution are a sensitive and heavily censored chapter in China's history. Official government mentions of the era are rare and brief. Allen Ginsberg refers to "Red Guards battling country workers in Nanking" in the first line of his poem "Returning North of Vortex," included in the collection The Fall of America: Poems of These States. In The Last Emperor, the Red Guard appeared near the end of the film humiliating the prison warden who treated the Emperor of China Puyi kindly. In Farewell My Concubine, the Red Guards humiliate Cheng Dieyi and Duan Xiaolou as they try to overthrow the old society. In the film The Blue Kite, Tei Tou's classmates are shown wearing the red scarves of the red guards, and the film ends with the red guards denouncing his stepfather. Nien Cheng's memoir Life and Death in Shanghai describes Red Guard activities in Shanghai during the Cultural Revolution. The video game Command & Conquer: Generals misleadingly named the Chinese standard infantry unit the "Red Guard", that ensured the game's ban in China. Li Cunxin makes repeated reference to the Red Guards in his autobiography, Mao's Last Dancer. In the book Red Flower of China, Zhai Zhenhua recounts her time as a Red Guard. Yang Rae recounts her time in the Red Guards and in the countryside in Spider Eaters. In the novel Frog by Mo Yan, Red Guard is mentioned on several occasions, like public prosecution. Members of the Red Guard are featured prominently in the novel The Three-Body Problem by the Chinese novelist Liu Cixin. ^ a b Jiaqi, Yan; Gao Gao. Turbulent Decade: A History of the Cultural Revolution. University of Hawaii Press. pp. 56–64. ISBN 0-8248-1695-1. ^ "China's reluctant Emperor", The New York Times, Sheila Melvin, Sept. 7, 2011. ^ Jeni Hung (5 April 2003). "Children of confucius". The Spectator. Retrieved 4 March 2007. ^ "Burn, loot and pillage! Destruction of antiques during China's Cultural Revolution". AFC China. 10 February 2013. ^ bo, Lo (April 1987). "I Was a Teenage Red Guard". New Internationalist Magazine. ^ Yang, Rae (1997). Spider Eaters. University of California Press. p. 116. ^ Bramall, Chris. Industrialization of Rural China, p. 148. Oxford University Press (Oxford), 2007. ISBN 0199275939. ^ "Up to the mountains, down to the villages (1968)". chineseposters.net. Retrieved 13 February 2017. ^ "Bowed and Remorseful, Former Red Guard Recalls Teacher’s Death", The New York Times, Chris Buckley, January 12, 2014. Howard, R; "Red Guards are always right". New Society, 2 February 1967, pp169–70. Van der Sprenkel, S; The Red Guards in perspective. New Society, 22 September 1966, pp455–6.